Want to save yourself some cash and look after your health at the same time? 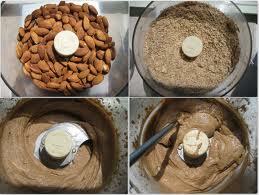 Well why not make your own Nut Butters, be it Almond, Peanut, Cashew, Macadamia or any other variety. For example , a small 250g jar of macro almond butter from Woolworths costs $6.95 but a 750g bag of Raw Almonds only costs $11.98 so make sense to make your own eh.Plus, by making your own, you know there is no added sugars or salt. You can leave them 100% natural, as i have them or add vanilla essence, stevia, or cinnamon if you wish. 1. Place Almonds on a tray in middle of preheated oven to roast for 13- 15 mins. 2. 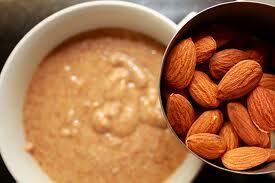 Put Almonds in Blender/ food processor 200g at a time and hit the pulse button a few times. 4. As the natural oils come out the nuts, the mixture will soften and form clumps. be patient and keep blending, still scraping the sides of blender occasionally.. If you add too many nuts it will take longer. It is better to get to a paste and then add a few more nuts at a time if you are making a batch bigger than 200g. You can always add a dash of peanut oil/ macadamia nut oil to speeden the process if you wish. 5. After a while it will start to form a paste, then it is up to you on what consistancy you want. I prefer to let the mixture go til it is smooth and super creamy.